Visit http://RaveLoop.com for more events. 10% promo code is only valid with online tickets purchased by 7:00 pm the night of event. Ticket prices at the box office will be higher since our promo code cannot be used there. 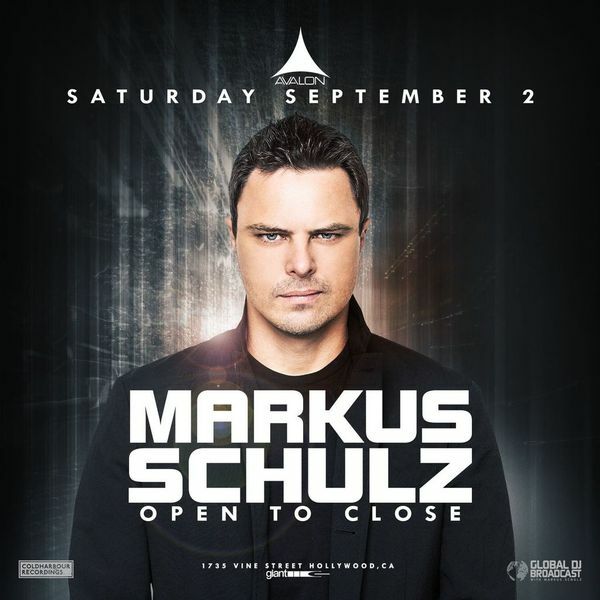 For over a decade, Markus Schulz has been at the forefront of Trance, creating a wild ride for any fan daring to enter his mesmerizing rabbit hole filled with a hybrid sound of Progressive Trance and House. Having released music with Ultra Records, Armada, A State Of Trance, and many more, Markus Schulz has solidified his position as one of the top producers in the game. And with a reputation for spinning beautiful 10+ hour marathon DJ sets, it is no wonder Schulz is hailed as a modern titan of dance music. PARKING: Lots near Avalon or by Hollywood & Vine. DRESS CODE: Upscale fashionable. No beach clothing, shorts, sandals, tank tops, sporting attire or baseball hats. Management reserves the right to make all final dress code decisions & can refuse entry for any reason. MEETUP INFO: This is a non-hosted event. Please comment below & make arrangements to meet up with our members. The suggested meetup spot is inside Avalon at the Pioneer DJ Lounge by the stairs. The Pioneer DJ Lounge is adjacent to the middle bar, which is the very first bar when you walk inside.